Dr. Mommy Dentist: meet the new prime minister of canada! meet the new prime minister of canada! this is stephen harper, leader of the conservative party. for the first time in a loooooong number of years, the conservatives have taken control of parliament in a minority government. no one's panicking at this point, tho, because they do only have a minority number of seats, although paul martin's career is probably over at this point. such a shame, he was a pretty nice guy and did a lot as finance minister. 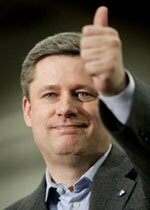 rumor has it that harper was bush's number one choice because apparently he lets little things like trade tariffs slide and he's a supporter of the war in iraq. great, that's all i need, for canada to enter the war with, what, like the 2 soldiers they have and then have to worry about taking the buses and subways again? but like i said, just try to get it passed in a minority government. i don't think the NDPs will be alliancing themselves with them any time soon and the bloc quebecois, well... they just want to separate and they'll be happy. coming to new york in a few days, got lots to do before then. oh, and i start work on january 31! it will be good to get out of the house, and i'm soooo going to love working in downtown toronto. i'm not getting my hopes or expectations too high, i've been "scarred" by so many places. just as long as i get paid well and no one bothers me, patients included, i'll be content. that's not too much to ask for, is it? Hope you have a safe trip to NY!! I'd love to go again. If you went to NYU I'm sure you've eaten at the cozy soup and burger diner near the NYU village. I looove the burgers there. it really is a small world... unfortunately.